Can I use this as a pre-req? You can use the SRNA program as a pre-req for nursing programs. Unfortunately, we do not award college credit. We do not have any other locations at this time. What’s the difference in a CCMA and a SRNA/CNA? CCMA students will be taught skills that are typically used in a doctors office or clinic settings. SRNAs work in a variety of settings (long term care, hospitals, offices, etc.). They are more hands on with patients and provide daily care. That is dependent on the course you sign up for. Yes, we offer convenient payment plans, please contact Debbie Zafren by email Debbie@khtnow.com or by phone 859-963-2952 for more information. See our Tuition Assistance page for a list of organizations and businesses that have provided financial assistance for our students. Do you accept FAFSA or other financial aid? We do not accept FAFSA at this time. We can work with students who receive government assistance to see if they can get financial assistance. We work with programs like WIA, Voc Rehab, and Community Based Services. For more information, check out the tuition assistance page here. Do you do you refunds? 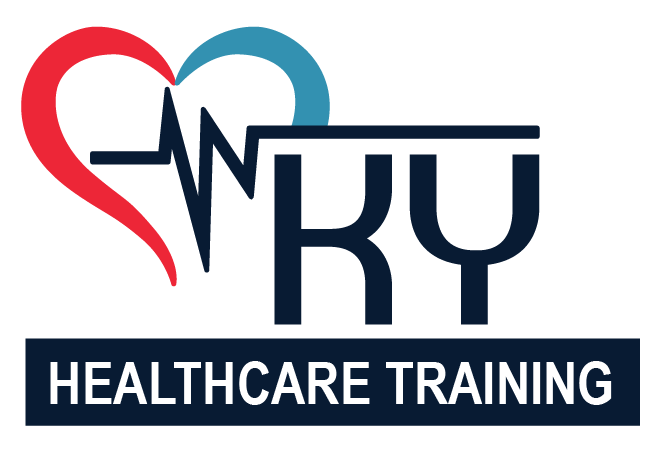 We accept cash, credit card, and checks (made payable to KY Healthcare Training). What if I’m unable to pay off my balance before the class is over? Students on our Convenient Payment Plan who are up-to-date on their payments will be able to take their respective State or National Exam and be awarded a certificate. Students not on our convenient payment plan will need to have completed payment of any debt owed to KHT before they can be registered for their State or National Exam and be awarded a certificate. It varies depending on the class. What do I need to bring on first day of classes? We ask that our students bring note taking materials, highlighters, pencils, etc. You are welcome to bring your lunch if you would like. We have a refrigerator and microwave for our students to use. You can also leave to get lunch. There are several fast food places nearby. For the SRNA course, you MUST attend the first two days of class. If you miss one of the first two days, you cannot go to clinicals and must make up the corresponding day with the next class. If you miss any days outside of the first two, you can just make them up on your own time by sitting in with another class. However, if you miss three or more days, you must make up your time before you can go to clinicals. For Phlebotomy and CCMA, you can still make up any days that you miss but the same three-day rule applies. If you miss three or more days, you cannot go to your clinicals until the time is made up. For EKG, we highly encourage perfect attendance. This is a very intense high information course. However, if you do miss a day you can make up your time. **It should be noted that ALL students are allowed 90 days from their start date to make up any time missed. Should they fail to comply to this policy, they may be required to restart their program. You can wear whatever you like to class as long as it is appropriate (i.e. no short skirts/shorts, no low-cut tops, no crop tops, spaghetti string tops, nothing showing excessive skin.) You may choose to wear your scrubs if you like but it’s not required. I’m under 18, can I still take the courses? You can take the SRNA course if you are at least 16 years of age and have parental consent. However, you may have difficulty finding work as most facilities will only hire 18 and over. Some long-term care facilities will hire at 16. We very rarely have any students who do not pass our course. We work with our students as best we can to ensure that everyone passes. However, if a student does fail, the owner can help work with that student individually to come up with a solution. I’ve had an emergency and can’t attend class. Can I reschedule? We understand that things come up and life happens. We will work with students who have issues with attending class on a case-by-case basis. We will send an email by 7 am if classes are cancelled. We do. They are offered once a month on a Friday evening for $50. How long does it take to get back state/national test results? Up to 30 days for the SRNA state test. The national exams for EKG, Phlebotomy, and CCMA are instant. How do I schedule state/national test? SRNA: You will need to decide where it is you would like to take your state exam. KCTCS handles the exams for Kentucky. They have several locations. We can help you find a location close to you if you need assistance. Once you decide where you would like to go, we will send a roster to your exam site to confirm your course completion. You will then have to contact your test site to pay the fee for the test. EKG/Phlebotomy/CCMA: Contact us and we will set you up to take your exam in our school. It is taken online and proctored by our faculty. I’ve failed my state exam. Now what? You can retake the state exam two additional times. You only must retake the test portion which you didn’t pass. The written portion is $15 to retake and the skills portion is $60. What kind/color scrubs do I need? All our students are required to wear royal blue scrubs and light colored (tan, white, gray) closed toed shoes. Some students opt to wear long sleeves under their scrub top. We only allow WHITE shirts under your scrubs. No outer wear is allowed over your scrubs. No headgear or excessive jewelry is allowed. All tattoos must be covered. There are no exceptions to this rule. If you show up to clinicals out of dress code you will be asked to leave for the day and allowed to make up your clinicals at a different time. In addition, Phlebotomy students are required to also wear a white lab coat. CCMA students are required to have a stethoscope and a watch with a second hand as well as the above uniform. What if I can’t get my TB test in time for my clinicals? We cannot send any student to clinicals without a TB test. You must wait to go to clinicals with the next class. I’m an online student and I can’t attend my skills/clinical dates. What do I need to do? We allow our online students to move their skills/clinical dates one time. Do I need to arrange my own clinicals? SRNA students will go with their class and instructor to clinicals over a weekend. Phlebotomy/CCMA students will work with their instructor to arrange their clinicals. Can I use my own site for clinicals? SRNAs cannot use their own site. Phleb./CCMA can sometimes work with their instructor to try and arrange clinicals at a site of their choice. This is not common but has been done in the past. To do this, the school must create a contract with the site of choice. Can I use an old TB test? We have recently transitioned to asking our students to get a blood draw TB test. However, if a student has a one-step TB test from within the past year, we will allow them to get a second step in lieu of the blood draw test. Please see our TB Test Policy. I do not have my social security card. What can be a substitute? Any students who do not have a SSC will need to request one from their local social security office. We can accept the temporary proof they will provide you. But you MUST bring in your official SSC non-laminated before we can schedule your state test. This is because you are required to take your SSC with you to take your state exam. SRNA students need to turn in their photo ID, social security card, and TB test. Phlebotomy and CCMA students need a HS Diploma/GED, photo ID, social security card, TB test, immunization record, and HBV or declination of. EKG students need HS Diploma/GED, photo ID and social security card. Do I need a HS diploma/GED for the SRNA course? We do not require a HS diploma/Ged for SRNA students, but do for our other students. What if I have a questionable background? We will discuss that with the student. If there are any felonies in your background that were not dismissed, we will most likely not be able to accept you as a student. We do disclose to our students that if you have any misdemeanors or felonies involving drug abuse/sale, child abuse/neglect, or domestic abuse you will have a lot of trouble finding a job in this industry. I can’t find my immunization records. What should I do? You can see your PCP and have them draw a titre. We can accept those results as well. All students required to attend clinicals must be deemed, clinically, free of tuberculosis prior to clinical rotations. To do this, students must have the TB Gold or T Spot blood test, a chest x-ray, or a two step TB skin test. The two step skin test involves obtaining a TB skin test, go back in two days to have it read for interpretation then go back in seven to ten days for another skin test and return in two days to have it read. The TB skin tests and the chest x-ray may be obtained at Urgent Care Lexington at 1701 Nicholasville Rd or the blood test may be obtained at Baptist Worx at 1051 Newtown Pike. The blood test involves having a blood sample taken and tested for TB, Baptist Worx requires the pt. be seen before 2:30 pm and the test results are back within 24 hours. If you have a current 1-step TB skin test (within the last year), you will need to get the second step or you may opt to get the blood draw test. If we do not receive your TB test by the deadline, you will not be able to attend your clinical dates and will need to reschedule them with the lead instructor. We will only allow students to reschedule one(1)time.